There is a story – and I’m told it’s not apocryphal – that the Liverpool Echo used to employ a man whose sole reason for existence was to tell advertisers to go away. Apparently, in the dim and distant past (I believe this means the 1960s but certainly there are old timers who remember the phenomenon) people wanting to place adverts in that night’s Echo would be queuing in the front reception area in the hope of winning a slot. Sometime during the afternoon, this worthy would be dispatched to tell them there was simply no more room for adverts and they should all go home and try their luck again the following day. I’ve heard this story a few times – it’s always told with a rueful laugh and a ‘if only’ nod at the current situation – but it doesn’t get any more incredible with each telling. 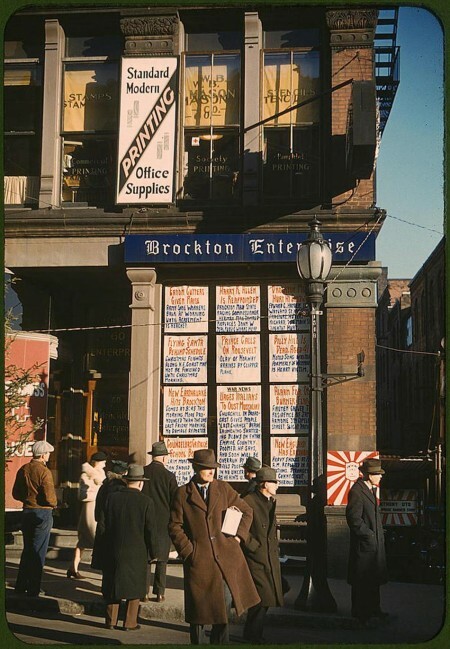 … it shows the Brockton Enterprise newspaper, circa1940, complete with a ‘news feed’ powered by windows (rather than Windows) and I thought it was just great. I love that a paper was putting its information out into the world like that, using the front of its office as an extension of the front page, and a way of spreading information further. Obviously the hope was that a lot of those passing eyeballs could be converted into sales but there would have been no guarantee. Somewhere along the way, it feels like newspapers lost sight of getting the story out there, in people’s hands, in front of their eyes, and instead started following the line of it’s not a story until we’ve told it (sometimes phrased as it’s not old until it’s told – a homily absolutely loathe). And lately it seems the shift has moved again, to encompass whether that story should be told free – in print or online. Holding stories because you haven’t got the space/are planning ahead/ in print was our stock-in-trade for years; we don’t have the issue of too little space online but putting it all out there for the audience is a digital v print battle that gets fought on a daily basis. Sometimes you win, sometimes you lose, every time it happens you wonder why the argument still needs to be had. Debate about charging online, paywalls, pay-per-click, audience growth, unique users, page views et al, but at the end of the day you become a journalist because you get to tell people things they didn’t know. Important, interesting, fun or unusual things (sometimes all of these). We have to start seeing the website as our shop window. * Photo found on the Brain Traffic blog via Doug Fisher’s Common Sense Journalism blog (always a worthwhile read).